A scanning electron microscope image of nanocardboard, showing its sandwich structure. Image: University of Pennsylvania. A team of engineers from the University of Pennsylvania has demonstrated a new material they call ‘nanocardboard’, an ultrathin equivalent of corrugated paper cardboard. A square centimeter of nanocardboard weighs less than a thousandth of a gram and can spring back into shape after being bent in half. Nanocardboard comprises an aluminum oxide film with a thickness of tens of nanometers, which forms a hollow plate with a height of tens of microns. Its sandwich structure, similar to that of corrugated cardboard, makes it more than ten thousand times as stiff as a solid plate of the same mass. Nanocardboard's stiffness-to-weight ratio makes it ideal for aerospace and microrobotic applications, where every gram counts. In addition to unprecedented mechanical properties, nanocardboard is a supreme thermal insulator, as it mostly consists of empty space. Future work will explore an intriguing phenomenon that results from nanocardboard’s combination of properties: shining a light on a piece of nanocardboard allows it to levitate. Heat from the light creates a difference in temperature between the two sides of the plate, which pushes a current of air molecules out through the bottom. Igor Bargatin, assistant professor of mechanical engineering and applied mechanics, along with lab members Chen Lin and Samuel Nicaise, led the study. They collaborated with Prashant Purohit, professor in mechanical engineering and applied mechanics, and his graduate student Jaspreet Singh, as well as Gerald Lopez and Meredith Metzler of the Singh Center for Nanotechnology. Bargatin lab members Drew Lilley, Joan Cortes, Pengcheng Jiao and Mohsen Azadi also contributed to the study. The engineers report their findings in a paper in Nature Communications. "Corrugated cardboard is generally the sandwich structure people are most familiar with," Bargatin says. "It's ubiquitous in shipping because it's both lightweight and stiff. But these structures are everywhere; the door to your house is probably a sandwich structure, with solid veneers on either side and a lighter core, such as honeycomb lattice, on the interior." Sandwich structures are attractive because they reduce the overall weight of a material without sacrificing much in the way of its overall strength. They can't be entirely hollow, however, as that would cause them to be floppy and prone to shear, meaning when forces move the two solid faces in opposite directions. "Even if you make something out of a solid block of the same material, the central portion of the cross-section would not be carrying much of the bending stress," Purohit says. "Shear stresses are, however, maximum at the center of the cross-section, so as long as you put something in the center that is particularly good at resisting shear stresses, like a honeycomb, you're making a good and efficient use of the material." Sandwich composites like corrugated paper cardboard are known to provide the best possible combination of low weight and high stiffness. "Not surprisingly," Nicaise says, "evolution has also produced natural sandwich structures in some plant leaves and animal bones, as well as in the microscopic algae called diatoms." The difficulty of scaling this concept down to the nanoscale has to do with the way the sandwich layers are connected to the interior. "At the macroscale," Bargatin explains, "you can just glue the face sheets and the lattice together, but at the nanoscale, the structures we work with are thousands of times thinner than any layer of glue you can find." To be made at all, nanocardboard would need to be monolithic – composed of a single contiguous piece of material. But this raises the question of how to give such a material the necessary sandwich layers? The team's solution came from a serendipitous connection at the Singh Center for Nanotechnology, which provides research resources for faculty at the University of Pennsylvania, but also characterization and manufacturing services for outside clients. The Singh Center's Gerald Lopez and Meredith Metzler were helping a nearby research institution with a problem they were having with blood filters designed to capture circulating tumor cells and macrophages for study. "Because the blood filters were so flimsy, they would often tear during the filtering process. However, if they were successful, the filters would still warp and bend under the microscope, meaning the researchers had a hard time keeping them in focus," Lopez says. "Our solution was to pattern our filters using a thin sheet of silicon over glass," Metzler says. "By making the pores 9µm in diameter and a 100µm deep, about the thickness of a human hair, we ultimately came up with something much stiffer and better than what the researchers were buying for $300 each." "So, when we came to Meredith and Gerald," Bargatin says, "and asked them about making our structures, they said they were working on something similar and that they thought they knew how to do it." The process they came up with involves making a solid silicon template with channels running through it, over which they deposit a nanometer-thick layer of aluminum oxide. After the template is encased, the nanocardboard can be cut to size. Once the sides are exposed, the silicon on the inside can be etched away, leaving a hollow shell of aluminum oxide with a network of tubes connecting the top and bottom faces. The team's first design featured distantly spaced circular channels going through the sheets, much like the blood filter. But despite simulations predicting that it would provide the optimal stiffness, these first designs failed. "The problem was that wrinkles would randomly form along the lines between those channels," Bargatin says. "Whenever we tried to measure their properties, we'd get unrepeatable results." The team ultimately settled on a basket-weave pattern, featuring close-set, slit-shaped channels arranged in alternating directions. "If a wrinkle wanted to form," Bargatin says, "it would need to meander around these channels, and they don't like to do that because it takes a lot of energy." The basket-weave pattern not only explains nanocardboard's resilience to wrinkles but is also key to its toughness under extreme bending. "If you apply enough force, you can bend corrugated cardboard sharply, but it will snap; you'll create a crease where it becomes permanently weakened," Bargatin says. "That's the surprising thing about our nanocardboard; when you bend it, it recovers as if nothing happened. That has no precedent at the macroscale." 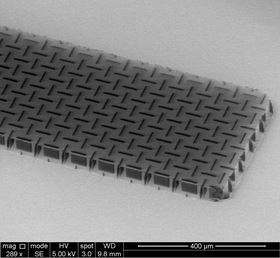 These unique mechanical and thermal properties are critical for nanocardboard's potential uses, from microrobotic flyers to thermal insulators in microfabricated energy converters, as the material would need to recover its shape regardless of what deformations or temperatures it goes through. Going forward, the researchers will explore these and other applications, including ones inspired by nanocardboard's ability to levitate. "Another appeal of this research," Nicaise says, "is that it shows us how we can engineer microstructures with properties that stem from their shape and not what they're made of."